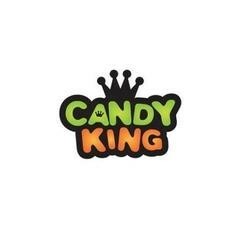 From the widely famous brand DripMore came Candy King. This vape juice line consist of candy based flavors that will make your please your sweet tooth with each puff. 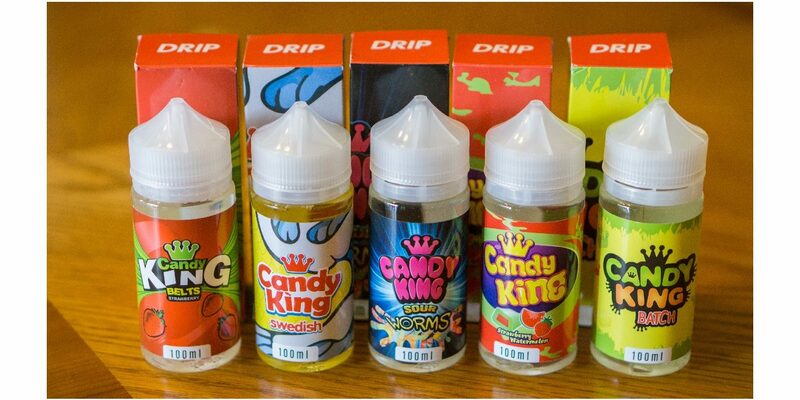 Candy King Vape Juice is only one of the six vape juice collections from DripMore. DripMore has been taking the vape industry by storm since day one and has now progressed their company into one of the most commonly enjoyed brands on the current market. They have achieved this by continually using high quality ingredients to provide flavor packed vape juice. Their other vape juice lines include, Original DripMore, Candy King, Candy King On Ice, Candy King On Salt, Cookie King, and their newest addition called Milk King. These ejuice lines provide a wide variety of different flavor that range from succulent candies, sweet desserts, and creamy milk bases. For whatever your sweet tooth has been craving Candy King by DripMore is sure to have that perfect candied flavor for you to kick those craving all day long. Candy King is bottled in a 100ml chubby gorilla bottle with 3 variants of nicotine, 0mg, 3mg, and 6mg. They have a PG/VG ratio of 70/30 that provides a puffy thick cloud of vapor with each exhale and a flavor packed experience that won’t leave you flavor blind. Batch by Candy King 100ml has a ultimate balance between tart and sweet fruity candies. Juicy oranges, sweet cherries, and tangy lemons provide the perfect fusion for this succulent e-liquid. With an added candy base Batch is sure to delight your taste buds from the first drop to the last. On the inhale is a sugar rush with those candy oranges. Light sour notes are next to follow to provide that authentic candy taste. Those sweet cherries will dance along you taste buds delighting them with each puff. To provide a refreshing exhale are those tangy lemons that might just cause your lips to pucker with pleasure. That original flavor from Batch is now on ice for all those menthol fanatics. Batch On Ice by Candy King and DripMore will please your sweet tooth all day long and will still provide that icy exhale you’ve been seeking for. Those tart and refreshing lemons fused with juicy cherries and ripe oranges will provide you with a sweet and tangy flavor that will delight from the first drop to the last. Just like Batch, on the inhale your tongue will be flooded with a sweet candy orange flavor that is fused with those juicy cherries. That savory orange flavor has light sour notes that provide a genuine candy flavor. On the exhale is a refreshing rush of sour lemons combined with a menthol base. This fusion between tart and sweet has been perfectly balanced to not have an overwhelming flavor, making this vape juice the ultimate all-day-vape flavor. Take those strawberry hard candies out of you purse, your desk drawer, or any place you’ve been hoarding your favorite treats, and indulge in Belts Strawberry by Candy King instead. Belts is the perfected reincarnation of those flavor packed strawberry candies and is sure to please with each puff. These juicy strawberries have been rolled in sugar to sweeten your taste buds to the max. This intense sweet candy flavor has been balanced out with light sour notes. These sour notes provide an authentic candy flavor without becoming overwhelming. On the inhale a rush of fresh and sweet strawberries is sure to please. Those sour notes dance across your taste buds and delight them with this tangy twist. On the exhale these flavor fuse together providing a sour and sweet strawberry candy taste. Belts Strawberry On Ice by Candy King takes that original Belts flavor and fuses it with an icy menthol base to provide a refreshing twist on this tangy candy blend. We all know that strawberries that have been dunked in sugar is the ONLY way to properly eat them. Now with Belts Strawberry On Ice you get that same authentic taste fused with a candy base to provide an even better flavor, yes it is actually possible. That isn’t where this e-liquid stops though, to insure and improve this sweet taste Candy King has added light sour notes that are sure to please. This combination of sour and sweet has a perfect balance that doesn’t make this flavor overwhelming. Menthol fanatics may need to take a seat when they hear this, This savory e-juice flavor is now “On Ice” and provides an refreshing cooling exhale after each puff. From the first hit to the last your taste buds will be delighted with this menthol flavor. Lemon Drops by Candy King 100ml is that genuine tart lemon hard candy flavor. This lemon flavor will not become bore to you nor will you lose site of this flavor, it is sure to come one of your new favorites. Those tart hard candies with a hit of sour are now packed into 100ml bottle for you to enjoy with this all-day-vape flavor. On the inhale your mouth will begin to water as a sugar-coated lemon flavor smothers your tongue and intoxicates you taste buds. The candy base fuses with sour notes to provide a sour candy lemon drop taste. These sour notes will dance across your tongue delighting your taste buds with each puff. On the exhale a lip puckering experience is sure to happen as those sour notes intensifies. This ultra-pleasing treat is perfected for anyone who still hoards those sour lemon candies, it’s okay though because we all know you do and we all do the same. Nobody can get enough of Lemon Drops by Candy King 100ml. Previously known as Sour Worms comes Worms by Candy King. We are certain by this name you can expect what flavor this vape juice is, but what you won’t expect from this e-juice is its authentic and intense flavor. The common flavors that are found within those original sour gummy worms are tart lemons, juicy green apples, tangy blue raspberry, savory oranges, and fresh cherries. This fusion of flavors are sure to please as they provide a balance between tart and sweet. The extra sour notes will make your sweet tooth scream with pleasure as finally those cravings have been satisfied with no added quit. On the inhale your tongue will be smothered with those lightly sour green apples and juicy oranges. Tart blue raspberries and juicy cherries are next to follow. Your taste buds will already be begging for another hit due to its intense flavor. On the exhale that candy lemon flavor provides a refreshing exhale and a smooth wash down from those savory fruit candies. Worms On Ice by Candy King isn’t the exact flavor you can find at your local gas station, but is sure to please, with this added icy menthol base you can experience a flavor like no other. With that original sour gummy flavor this e-juice has been complemented with a refreshing and cooling ending. That original Worm flavor from Candy King is here to stay with this new blend. That same rush of crisp green apples and savory oranges is provided on the inhale. Flooding into your mouth next is that tangy blue raspberry and sweet cherry flavor that will dance across your taste buds delighting them. The exhale is now new an improved, fusing with that lemon candy base is now an extra added menthol flavor to provide the perfected exhale. The name is sure to give away the flavor profile of this savory e-juice. This fusion of juicy strawberries and crisp watermelon has been fused with that original bubblegum taste that is sure to delight. No lip smacking and loud chewing is a result of this fruity blend is still sure to provide that authentic flavor so you won’t be missing out. Strawberry Watermelon Bubblegum has an intense strawberry flavor that has been complemented by a crisp and juicy watermelon to provide a refreshing taste. Plain bubblegum usually contains a mixture of fruity flavors, one of the most common being strawberries. Candy King has intensified this strawberry flavor, giving it the up most authentic flavor possible while still providing that original bubblegum flavor. On the inhale a rush of juicy strawberries will smother your taste buds. Dancing across them next is that crisp and juicy watermelon flavor that provides a refreshing taste. You can’t blow any pink bubbles on the exhale with this e-juice but the flavors fuse together providing a succulent and savory taste. When checking out at the grocery store one of the toughest decisions can be whether to grab your favorite pack of fruity gum or that minty and icy menthol flavor. Well now you won’t have to decide anymore with Strawberry Watermelon Bubblegum On Ice by Candy King. This authentic recreation blends that fruity flavored gum with an icy base to give you the best of both worlds. Just like Strawberry Watermelon Bubblegum by Candy King, the inhale is a rush of that intense strawberry flavor. A crisp watermelon flavor is next to follow giving this vape juice a refreshing twist. Even more refreshing is on the exhale with that minty menthol base. Swedish by Candy King takes that fish candy flavor and has turned it into an genuine recreation. This e-juice is sure to please with its intense and savory fruity flavor. These gummy fish candies have been said to taste like lingonberry, but has never been verified. Lingonberry is known to be a tart and sweet fruity flavor. Lingonberry is the English name for Vaccinium vitis-idaea, the fruit plant, and its name has been translated from Swedish. Confusing names and a fruit you have probably never heard of may just become your new favorite e-juice flavor. Almost identical to those original candies is this intense flavor that will please your taste buds from the first hit to the last.